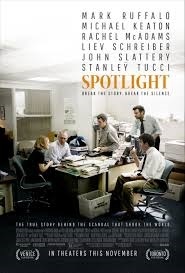 “Spotlight” boldly brings back into the spotlight (pun intended) and tells the true story of how the Boston Globe uncovered the massive scandal of child molestation and cover-up within the local Catholic Archdiocese, shaking up not only us the public, but the entire Catholic Church to its core. 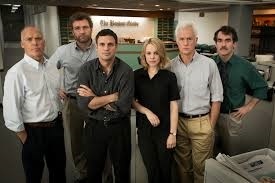 Michael Keaton plays Walter Robinson who leads the Globe’s investigative unit “Spotlight” along with Michael Rezendes (Mark Ruffalo), Sacha Pfeiffer (Rachel McAdams) and Matt Carroll (Brian d’Arcy James). At a time when the internet started undercutting actual newspapers & staffs of some of the biggest papers in town were being cut in half, the Globe brought in new editor, Marty Baron (Liev Schreiber), and the team begins to unfold a horrific pattern of child sexual abuse by the church that was muted and covered up by high priced lawyers and payoffs to victim’s families. 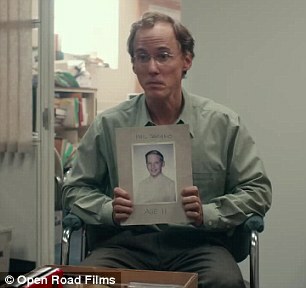 As Walter probes further and further into the events (the setting is just prior to, but mostly after the events of 9/11) the investigation reveals layers and layers of injustice of Catholic Priests that were aided by the highest powers of the church in an effort to keep the story muted. It all starts with a featured column about Catholic priest John Geoghan who was accused of abusing over 100 boys. A civil suit is filed but the details of the abuse were ordered sealed by the courts. As newly installed editor and the first Jewish one at that, Baron puts the team of reporters on the case and within days the evil that lurked with the sacred rooms of local churches begins to reveal it’s despicable face. The investigation goes on for months as the team hits roadblock upon roadblock taking one step forward for every two steps back. But the story eventually breaks and the emotionally exhausted team is eventually able to bring to light one of the more depressing and important stories to hit us in the new century. The performances are mostly good. Schreiber as Baron, the first Jewish editor is quiet, yet speaks volumes. Ruffalo with some oddly thrown in facial & body tics/expressions that are reminiscent of a bad Jimmy Olsen type reporter is almost annoying to a point, McAdams is her usual bland generic self. Keaton & Tucci both are good, though for Keaton, it’s not Birdman type good. There are more roles to be recognized in Billy Cruddup, Jamey Sheridan & notable is John Slattery. It’s truly an ensemble film as there are no specific leads. And of course nods to All the President’s Men will be inevitable. The film itself is fresh and invigorating in its painfully frustrating subject matter. It is at times painful to watch. 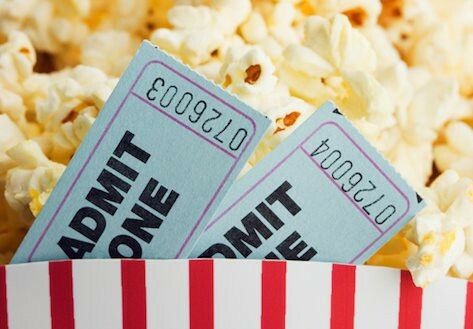 Trusted bonds between people, children, parents and the institution that promotes the opposite to what it sometimes preaches are disgusting revelations that are brought to the screen with sizzling effect. You won’t forget this movie or what happened any time soon after you see it, and truthfully, we never should. POST Q & A w/Producers: Michael Sugar, Nicole Rocklin, Blye Pagon Faust, Steve Golin ~ It’s always nice when the Producers, Director and Cast take the time out to do a post-screening Q & A. They talk about their passion for the projects and usually give great insight to their films. That’s why it surprised me so much that there was a huge exodus of people after this film. Usually you always get a few, but I would say 1/2 the audience emptied out. Not sure why, maybe they were disturbed by it, maybe they were Catholics upset by the fact that it happened, and maybe some still just don’t want to believe it. I found it sad because as a film-goer, you should have the decency to show respect to the people that again, took the time to come talk to you about a project. Moving on… All producers listed took the time to speak about the films budget, which at 20 million, but they still got good stars to come aboard even though there was no specific lead role, as it was a complete ensemble type film. Mark Ruffalo was the first to come aboard and they appreciated that because it brought others to the table. They also had to clear schedules because they wanted to shoot in the specific time of year of late fall, early winter as that’s when it all actually happened. The Boston Globe also let them shoot in their actual offices where everything took place. They also had to work closely to get all the legal aspects & clearances done correctly as you would be assuming correctly if you thought the Catholic Church was less than thrilled to be having this all brought up again in a film. The only reaction from the church has been the few apologies you’ve already seen. Since the piece first ran in Jan 2002, over 600 more articles were published by the Boston Globe unearthing more and more atrocities. The most moving moment was when a survivor was in the audience and thanked the producers for making this film and making sure we never forget and hopefully work harder to prevent this from happening again, as it still is going on all over the world..and not just in the catholic religion to be sure. Really enjoyed this movie and its phenomenal cast. I had the same experience as you at my Q&A; I don’t mind them leaving right after the movie–maybe they have something else to do–but some people waited until McCarthy and Singer were there and talking before leisurely walking out of the theater. That really annoyed me. By the way, are there any other theaters nearby that do Q&As aside from The Landmark? Nice review :)) I’ve heard good things about the film, argh its not released yet in my place but I’m super excited for this. I like how you said the effect is sizzling,considering the grim subject matter,you really hyped my interest now!! yay!!! it’s a rough watch to be sure.. and heart-wrenching.. but it’s good. 🙂 hope you enjoy it! I thought the acting was solid, but there wasn’t any actor I’d select to nominate for an award. However it should still get a ton of nominations this year. Well done film. agree.. no one stood out that much to get a nom.